How to grant domain permissions to others? Many users register domains not only for themselves but for others as well – family, friends, colleagues or customers. It is often wanted or needed that these users can access, and to a certain degree, manage their domains. For that, Joker.com customers can grant roles and permissions to other users. You always can invite additional individuals to administrate your domain(s). For this, you can assign so-called “roles” to other people, which define what sort of access is granted. Important: These “roles” solely allow to grant access to your domains within Joker.com, they do not have any impact on what is shown in Whois with its published contact data. To invite somebody to get access to your domains, a special link is sent to the email address you provide. If the invitee does not already have a Joker.com login, they will get a chance to register when they click the link in this email. When creating the role, you may enter a description to name the individual grant for being able to identify your grants later. You can access the grants dialogue in different ways. Only your latest domains will appear in this list. For large amounts of domains you could go directly to your domain list. There you can select “grants” in the menu. The third possibility is in the “modify domain” area where you can find “Additional granted Domain permissions (Roles)” at the bottom of the page. You always may issue grants or revoke existing grants in “My Domains“. 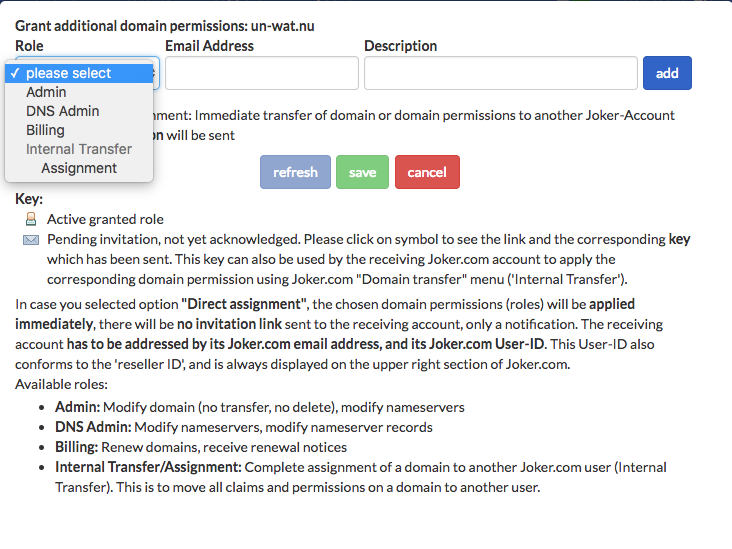 In case you are a Joker.com Reseller, you not only can assign permissions or whole domains to other users using an invitation similar to the procedure above, but you also may use a direct assignment, which will be applied immediately. Internal Transfer/Assignment: Complete assignment of a domain to another Joker.com user (Internal Transfer). This is to move all claims and permissions on a domain to another user.